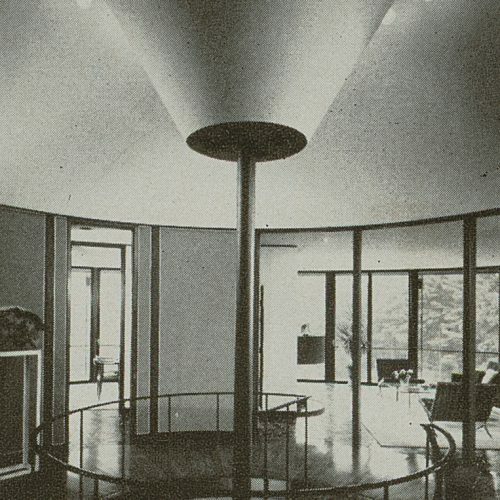 Revolving on its stationary pedestal at night, perhaps to settle on a starry scene for a dinner party, the round glass-walled house adds its own brilliance to the darkened countryside. 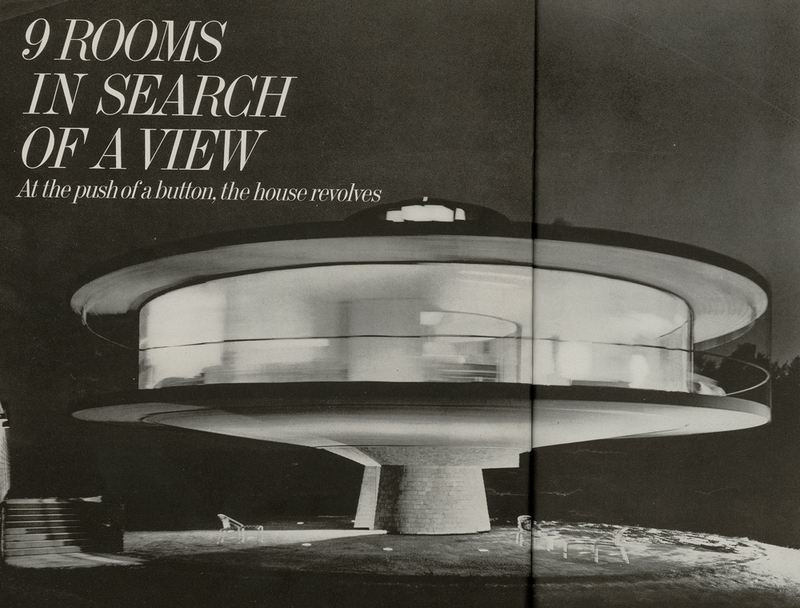 Lights on the round stone terrace shine up on the cedar-shingled supporting pedestal and front door, while lights inside the high-riding rooms and cupola win-dows make the house glow like a space ship. On the balcony that encircles the house, more lights define the deck and its railing. To the left, granite stairs lead to the walled parking court and garage. 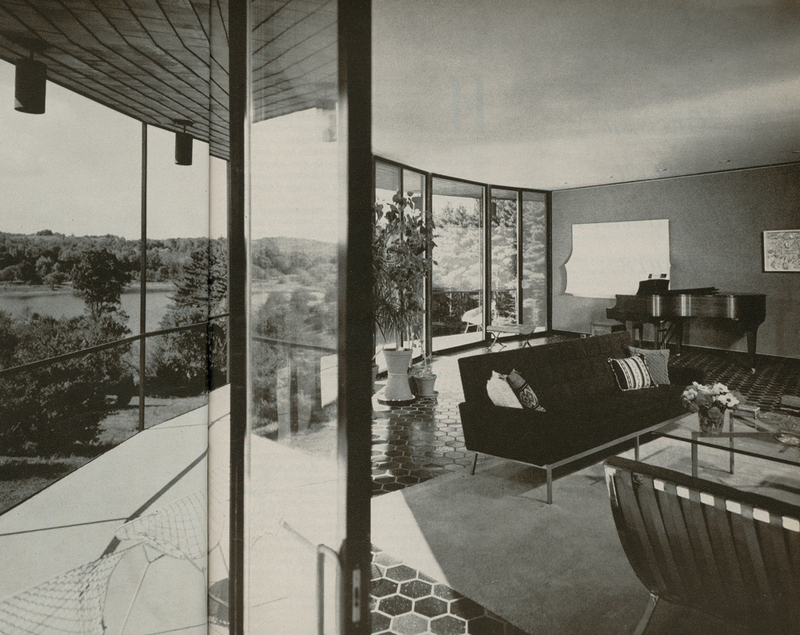 Photographs by Ezra Stoller. From a single spot in their living room, below, the Fosters can enjoy with push-button ease any seg-ment of the delightful 360-degree panorama, left, that surrounds their revolving glass-walled house. 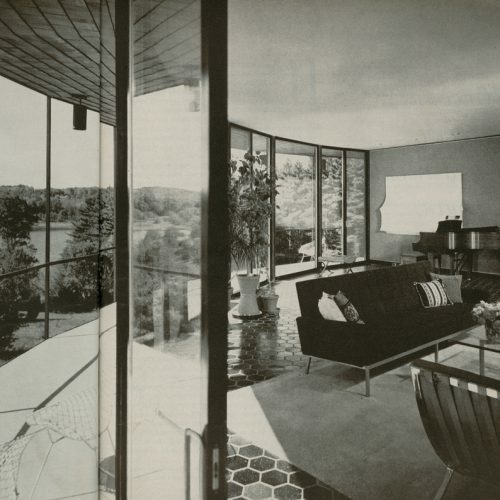 Photographs by Ezra Stoller. Left – a close-up tapestry of meadow grasses and wildflowers, with barn swallows swooping low. Middle – To the west: the peaceful distant scene of Pope’s Pond Reservoir and a grove of tall evergreen trees. Right – To the north: a nearby view of the pond and boat. Painting next to fireplace is by Marcelo Bonevardi. Photographs by Ezra Stoller. 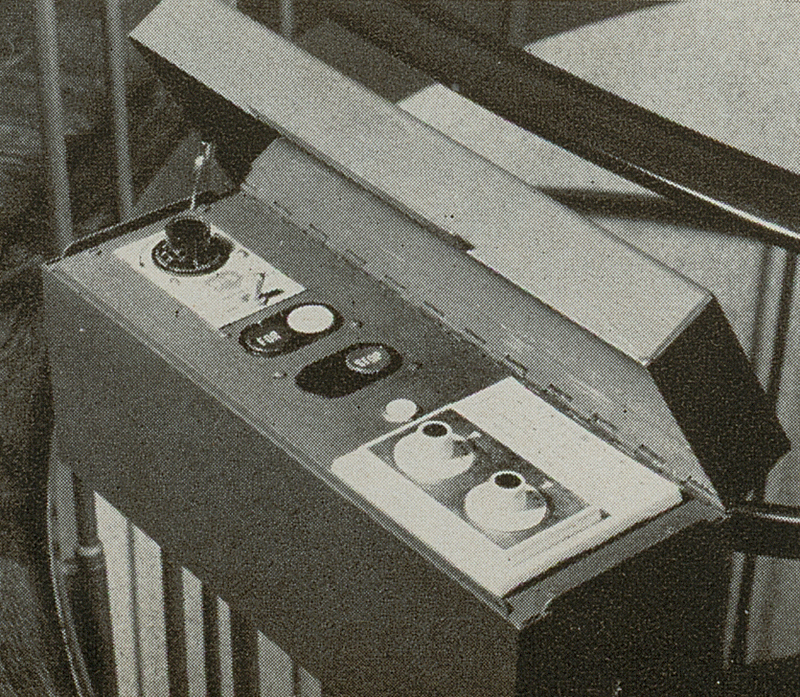 Control box for Round House. Photographs by Ezra Stoller. Pastoral Connecticut hillside, at the end of a drive-way marked by a rural mailbox, a breath-taking house perches amid breath-taking scenery. 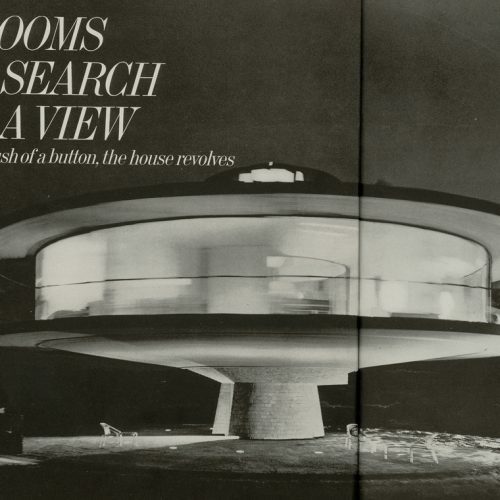 Resembling a giant glass-and-steel space ship, it creates a stir in the quiet landscape literally and figuratively : At the press of a button, all nine rooms of the house spin around, re-orienting to any point of the compass. 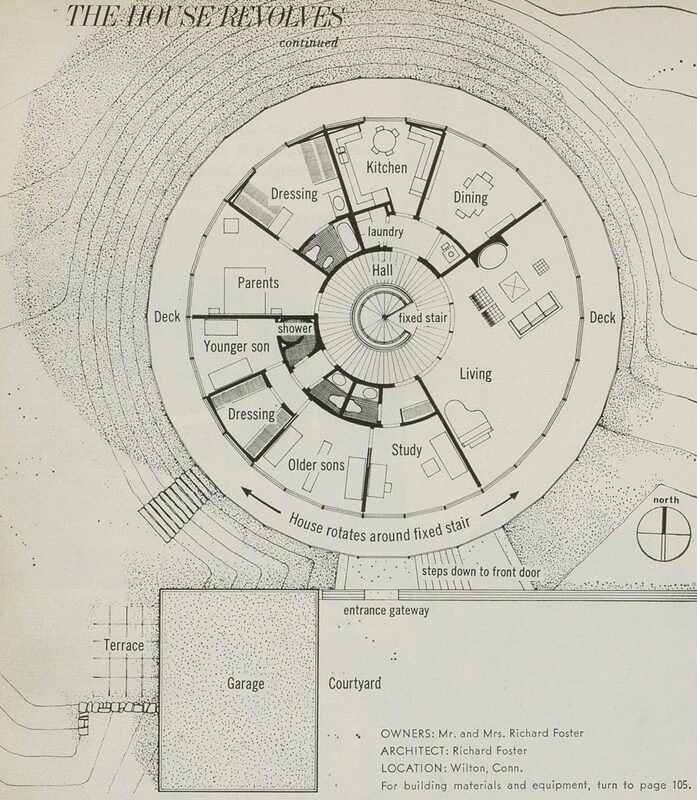 Yet it was not an infatuation with technology but a simple love of nature that prompted the design of this imaginative house that architect Richard Foster created for his own family. 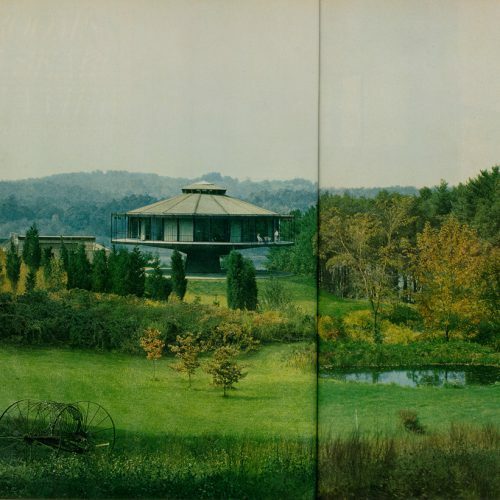 They couldn’t make up their minds which marvelous view they liked best among the several surrounding their six-acre site: the apple orchard, especially delightful in spring; the distant hills, so flamboyant with color in the fall; the meadow and pond, or the reservoir, both as lovely by day as under moonlight. 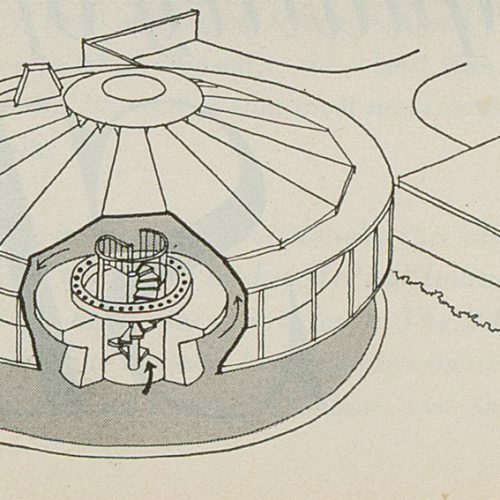 After discarding several plans for sit-still houses that necessarily sacrificed some views, Mr. Foster came up with his well-why-not solution : a carousel house from which his family could catch the golden ring every time around. 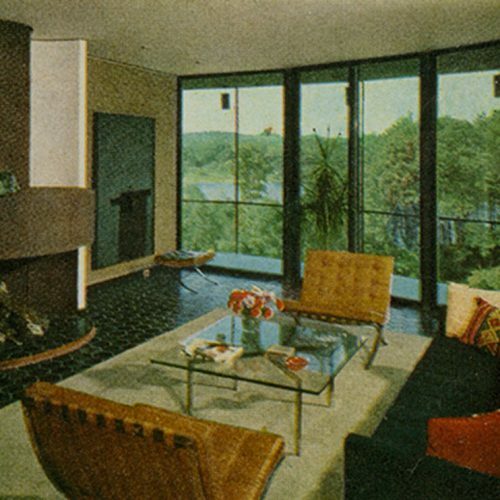 For the Fosters and their three sons, who range from high-school to medical-school age, the revolving house is a marvelous experience in pie-in-the-sky living. They can select the scene and direct the sunbeams, the moonlight, even the breezes, when and where they want them. From the same kitchen window, Mrs. Foster can watch the sunrise while she fixes breakfast and enjoy the sunset while she prepares dinner. And Mr. Foster is probably the only father in the U. S. who can awaken a sleep-late teen-ager on a Sunday morning by turning the house so that the sun streams into his room and onto his pillow. The Fosters’ imaginative castle in the air consists of a circular series of pie-shaped rooms that revolve around a stairway core enclosed in a fixed pedestal. 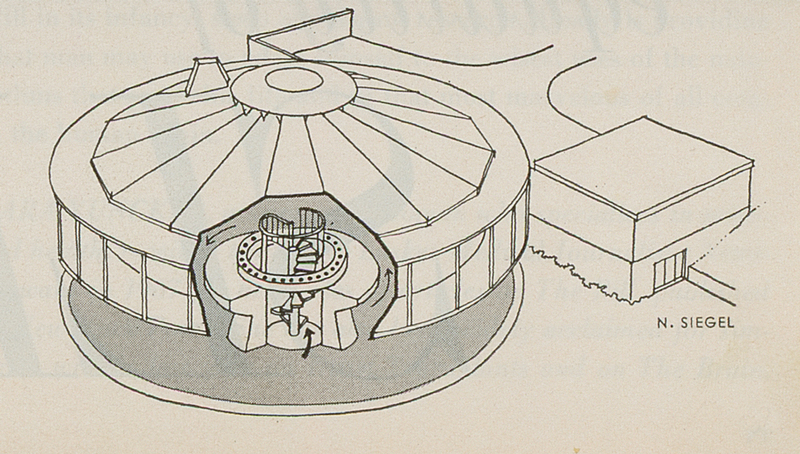 The rooms ride on a giant ball-bearing circling the stairway (see diagram, page 69) , which is powered by a 1.5-horsepower motor—approximately the energy needed for a large window air conditioner. The house can revolve clockwise or counterclockwise at ten speeds ranging from a baby snail’s pace of five turns a day to a top rate of one turn in forty-eight minutes. So smooth-going, so well concealed is the mechanism, that even when the house is turning at top speed, you are hardly aware of the motion unless you concentrate on a tree or some other fixed point outdoors. While the rooms revolve, everything else goes on as usual. The dishwasher runs, you can use the telephone or turn on a light, for architect Foster has worked out spectacularly ingenious de-vices that permit uninterrupted services. (Other structures such as restaurants revolve but rarely take bathrooms and kitchens for the ride.) He forecasts that variations of his prototype rotating system will some day revolve ski huts, beach houses, individual rooms, or even parts of rooms. In addition to playing its own special kind of roulette, the Fosters’ house meets admirably the needs of a family with almost grown children, including a large dressing room and a two-part bath for the boys. For rough-house activities and hobbies that are hard on housekeeping, the family uses the 24-by-30 foot lower level of the detached two-story garage. In the future, this space, in addition to housing an art work-shop, may be turned into a party room with kitchen and lavatory. 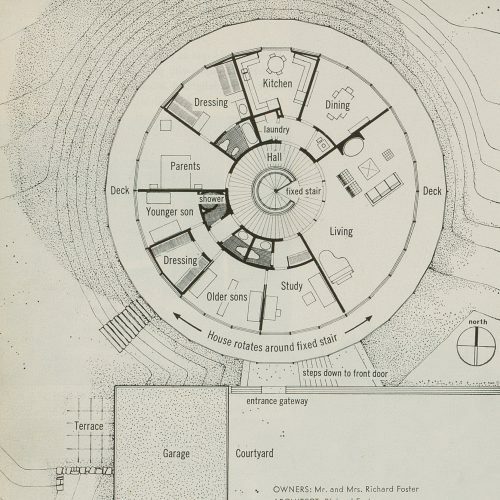 THE PLAN, above, 72 feet in diameter, consists of a circular center hall and a series of pie-shaped rooms that rotate around the stationary stairs. And the pie-shaped spaces are used to advantage : in the kitchen, for instance, counters and appliances are clustered conveniently at the narrow end, while a large table at the wider end enjoys the views. 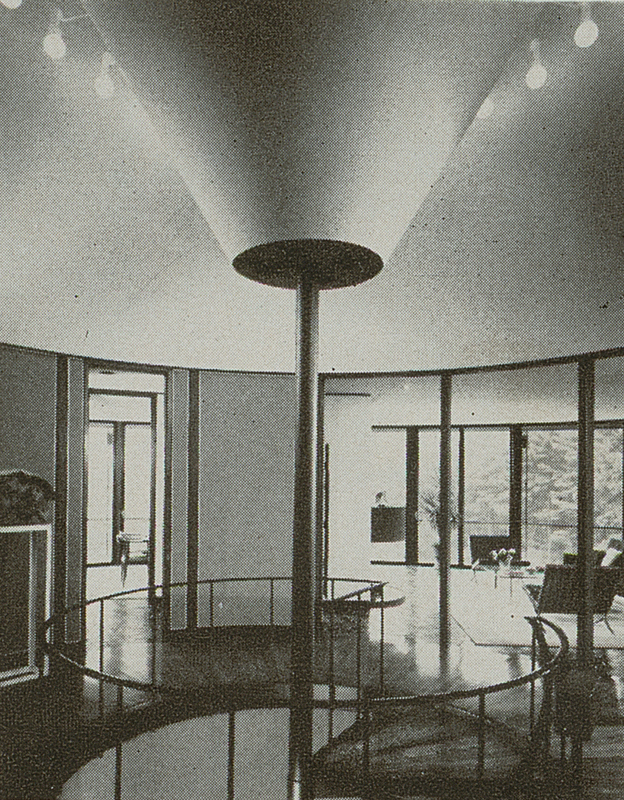 REVOLVING HALL, right, and fixed stair-well are brightly lighted by clerestory windows and a bubble skylight—and by lamps in and around the ceiling cone that deflects the direct rays of the noon sun coming through the skylight. 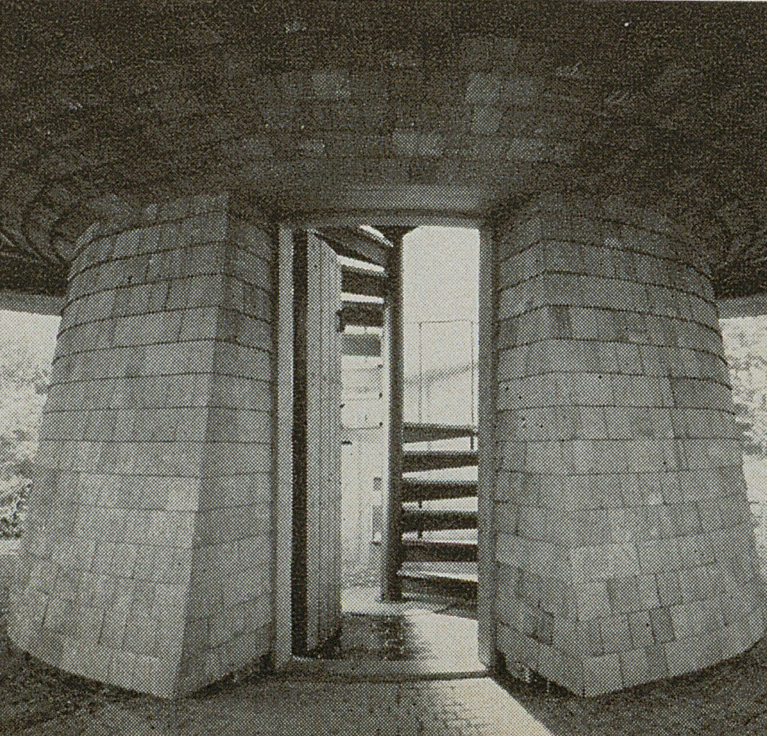 IN CEDAR-SHINGLED SUPPORTING PEDESTAL, below right, is the only door to the house and the stairs to rooms above. Vertical central shaft circled by stairs en-closes the water supply pipes, telephone cable, and electrical wiring. 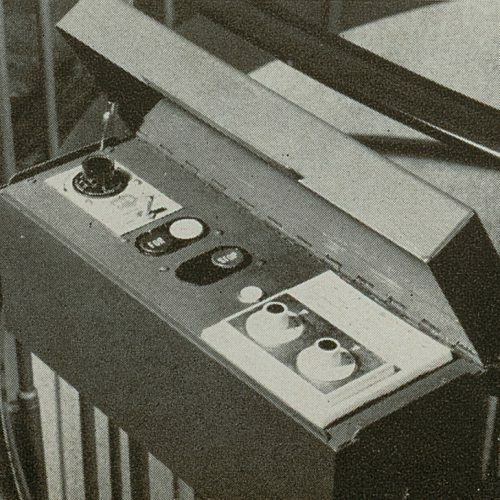 CONTROL BOX, far right, on the staircase balustrade, houses the dial and buttons that start the house spinning and stop it. The supersize ball-bearing, 14 feet in diameter (see diagram), is set in a raceway mounted on concrete directly underneath the hallway floor. 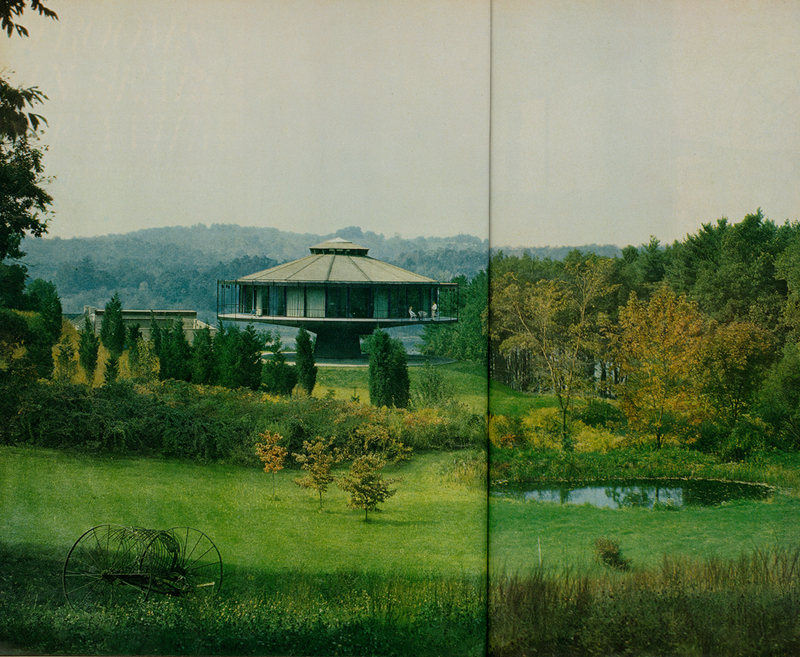 The materials, both exterior and interior, were carefully chosen, some to complement the action of the house, some for easy maintenance, all for good looks: for the shelter of the deck surrounding the house, above, cedar shingles, like those on the pedestal, that silver with time; for the railing, a no-upkeep steel that weathers to a rich brown, never needs painting ; for the deck floor, a topping similar to that used on ships ; for the floors indoors, cordovan-color ceramic tiles that can be vacuumed quickly (their hexagonal shape fits easily into pie-shaped rooms) . To offset the large areas of sound-reflecting glass and tile, and to make it easy to change paintings and wallhangings without leaving marks, walls of living room, above, and hall are covered with carpeting. Behind the piano : stretch-fabric sculpture by Bonalumi; a construction by Mary Bauermeister.